Taste the fun and flavor brought by the old fashion. 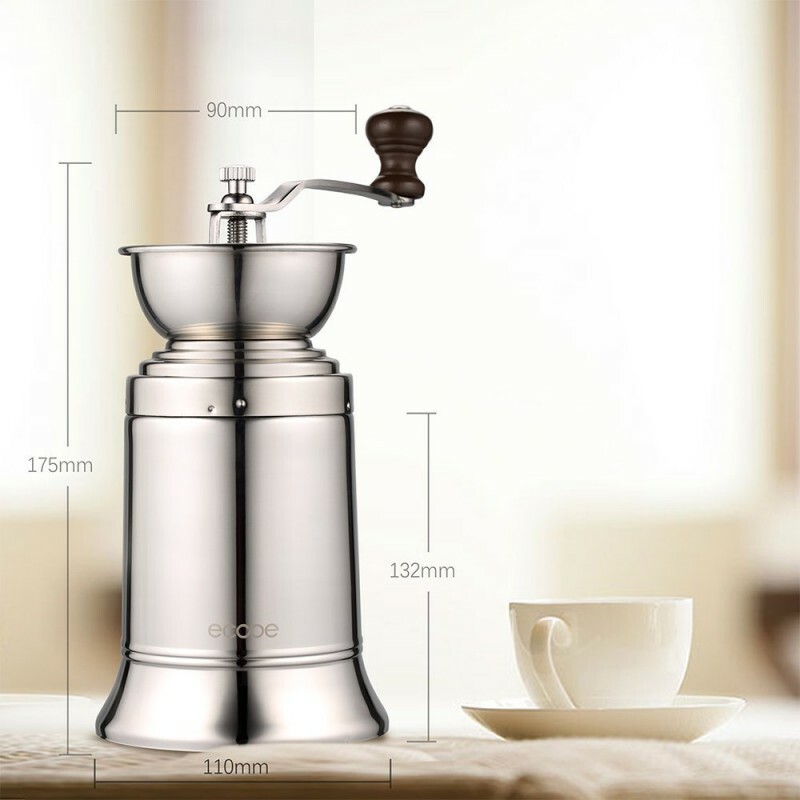 Adopted high quality stainless steel and the reinforced hand crank, the manual coffee grinder is sure to last for many years. 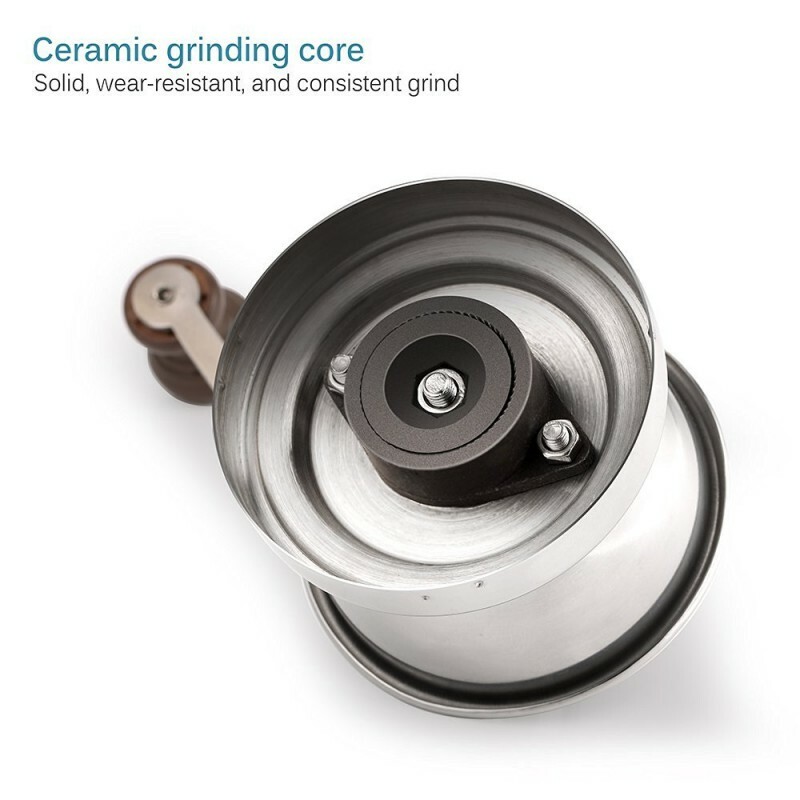 And the durable ceramic burr works quieter and absorbs less heat than other grinding mechanisms. The ceramic burr produces a uniform and even grind, making the filtration easy and perfect. While the silicone lid effectively keeps your coffee beans from sprinkling over during the process. 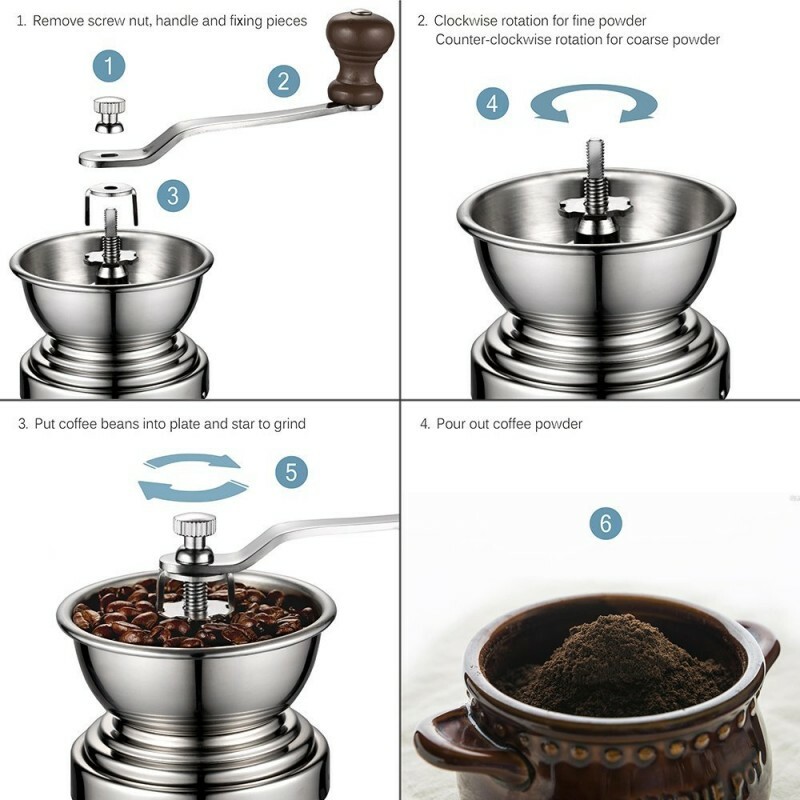 With just one manual coffee grinder, you can brew different flavors of coffee, by grinding your coffee beans either coarse or fine to meet for different brewing methods. Works great but does take a while to grind down the coffee since it grinds it so fine. 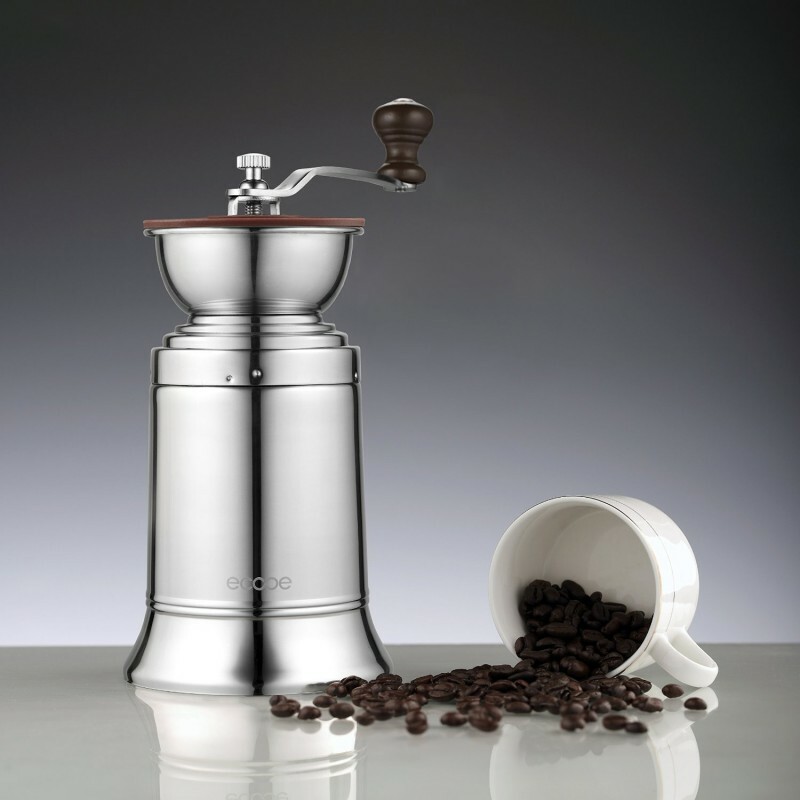 Great coffee grinder! It takes a little muscle to grind, but the results from whole beans to finely ground espresso powder for my Bialetti Moka Express are superb. Excellent Grinds, Questionable overall quality of the grinder. I use this daily and absolutely love it. I wanted a product with no plastics. I use this daily and absolutely love it. A perfect product for me. I love that it's so quiet. It's a recipe for stress and domestic distress. Instead, I enjoy the quiet rhythmic crunching as I turn the handle, a countdown to that glorious first cup of the day. But even more, I love that there is no sludge in the bottom of my coffee cup. This burr grinder gives a consistent, even grind with no dusty over-processed coffee powder, so my coffee is clean and smooth and flavorful. Bonus: the grounds rinse out of my french press much more easily too, because there is no fine muddy sludge to bind them together. If you like good coffee and have a minute or two to kill while the water heats, you really should give this a try. Alternately, you can make the kids grind your coffee for you and you'll experience improved coffee without feeling the burden of increased labor. I was extremely pleased with both the quality and construction of the grinder. Filled my grinding needs perfectly. This product works well. I use it to grind one or two cups worth of coffee every morning for my french press. 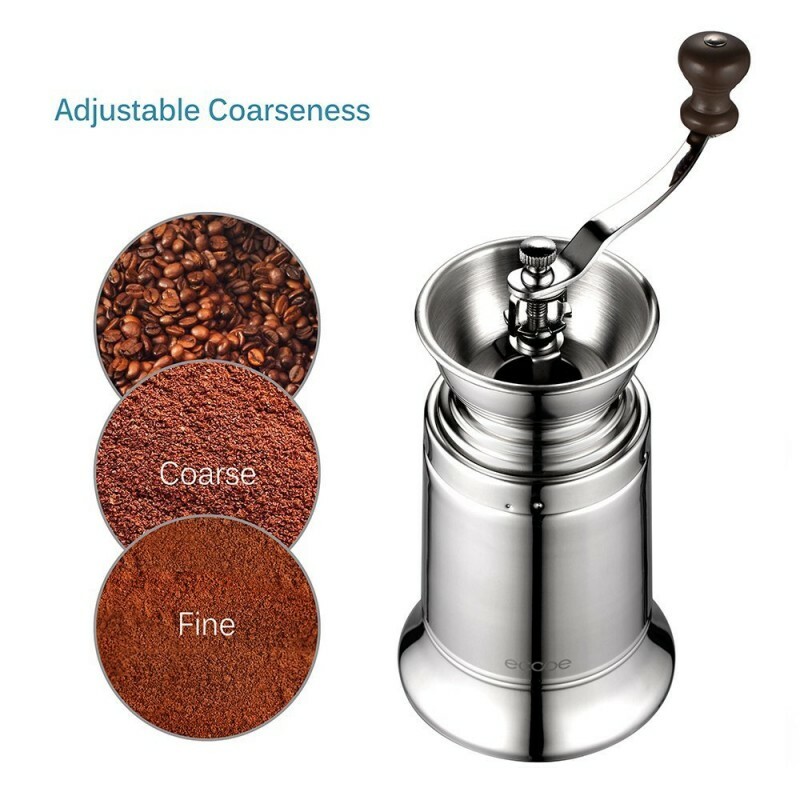 The grinder functions smooth and the mechanism for changing the coarseness of the grind is also easy to set. The entire grinder itself is very sturdy. Sometimes when I am in a rush, I can actually use my drill and attach it to the screw at the top and turn it into a power grinder. I highly recommend this product to anyone contemplating the purchase of a manual coffee grinder. It is a very enjoyable way to begin your day, grinding coffee and breathing in the smell of fresh crushed beans. I took one star off because the base of the grinder is also metal, which does not provide much traction. If there was a grippy material on the bottom I would give this five stars. I love my coffee. The best pot of coffee has 2/3 regular beans, supplemented with 1/3 dark chocolate flavored beans. I mix them in the coffee filter. I buy the regular coffee already ground, but the chocolate beans are something special. I hand grind those beans each morning. My new grinder has an open top bin for the beans. 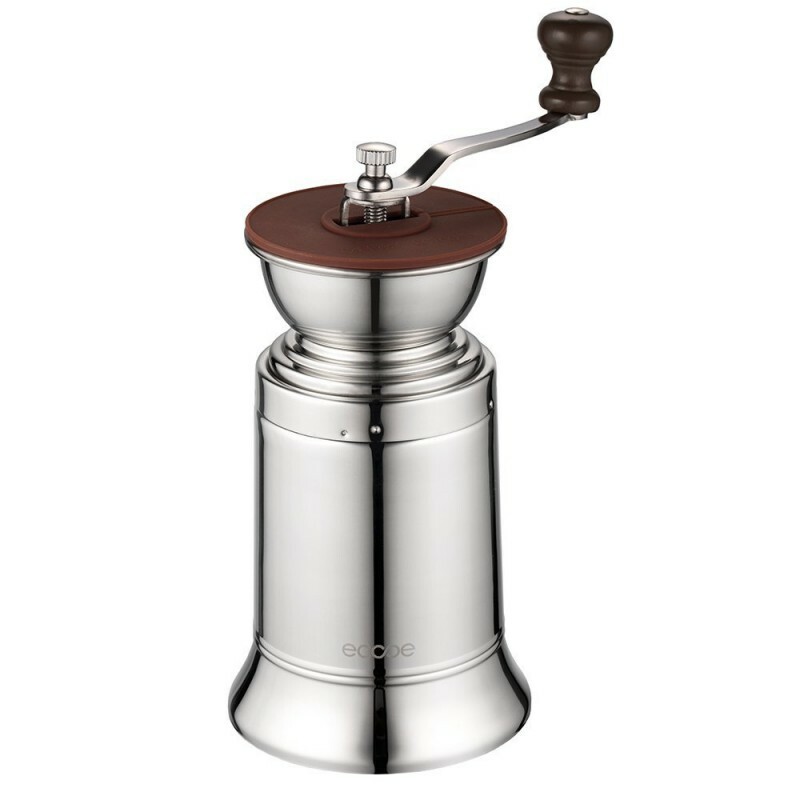 Finally a grinder built for a real coffee drinker. The open top is covered by a rubber stopper to keep your beans in. The long handle offers a tight and smooth grind when you turn it. The base is weighted so it is well balanced and won't tip easily. The collection bin is large enough to hold grind for a few pots of coffee. The grinder and bin below separate easily with a twist. The top locks into the bottom. Quality stainless steel grinder will last for years, even with my daily use. The grind is fine as frog hair. That's pretty fine! I was given a discount in exchange for an honest review. I consider quality of materials, workmanship, safety, and ease of use when evaluating each product. I appreciate all questions and comments. Thank you for reading my opinion.